I got word from her daughter that my neighbor and friend Virginia O'Connor passed away today. I spoke with her last week — she was in Hospice Care at her daughter's house. She was quite certain that would be our last chat, and I understood although I deliberately stayed naïvely upbeat for some reason. According to the paper, she was 92 (and I also learned that my former RIT chemistry professor, Earl Krakower passed two days later). It also said she was a school teacher — I don't know if we ever talked about that; then again, I suspect she didn't even know I had a blog. Although her health was failing, she did manage to go out for a walk almost every day, at least until the last week or so. She died with her family at her side in peace. I'll miss her nonetheless. This afternoon I was talking with my neighbor and a baby squirrel (okay, maybe an adolescent squirrel) came stumbling out and tried to befriend me. We suspected it was dislodged from a nest in the wind from a few days prior — or it was possibly Blondie's kin (that is, the so-named blond-hair squirrel that was flattened by automobile earlier this week). Whatever the reason, this inexperienced tree-rat was perfectly willing to let me pet it. I went in and got it a banana — it seemed quite receptive to me (well, anyone I guess) giving it affection. 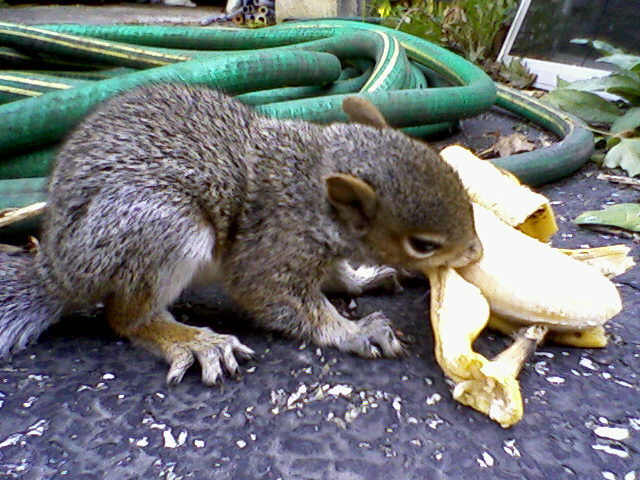 I pet it a bit and brought it some sunflower seeds as well. I decided to let it be and see if its instincts would kick in after a decent (?) meal, so I headed out. Well, come 1 a.m. when I got home, I searched for it and found its lifeless body in my driveway. I might have been able to do more, but I can only believe that its last hours were spent with a full belly, and with dreams of frolicking — cat-free — with its peers. Perchance, even, to run confidently along the squirrel superhighway (a.k.a. human utility service wires). Rest in peace, baby squirrel. I went to the Dryden Theatre at George Eastman House (900 East Ave.) to see Dead Man. I convinced Ali to not see it with me because I was worried it wasn't her kind of movie — and with other options like food at her parents' house or the video shoot for The Lobster Quadrille also going on, I didn't want her to feel like she wasted her time. Now after the fact, I think she probably would have liked it. One of the things I really enjoy about the Dryden is how the introductions bracket the film — to give one a way to see it and understand it rather than to find no way to understand it and simply dismiss it (especially in a case like this). Anyway, Dead Man is an excellent movie: a meditative cinematic poem about death on all sorts of different levels. All the actors in the film were stunningly convincing. The direction and cinematography offered a deliberate, steady pace with plenty of room to simply observe. It's about a guy named William Blake who goes west for a job in the town of Machine. When he arrives, there is no job for him — and he had spent all his savings to get there. He meets a woman, but his bad luck isn't done because her fiancee returns and in a blur of passion, shoots her and Blake who in turn shoots him. Injured, Blake heads for the hills and is aided by a Native American named Nobody — who happens to be a fan of poet William Blake in a moment that transcends the "fourth wall" like none other. The fiancee happens to be the son of the brutal, sole industrialist in Machine and puts a bounty on Blake's head. Meanwhile, Nobody declares Blake to be a dead man and spends his time preparing Blake for his journey to the other side. But that's not what the movie is about at all. What I got out of it was that it was about the reality of death. Not the part that it's inevitable, that it's permanent, or that it's man's greatest fear, but simply that it was, is, and will be. The Europeans slaughtered the Native Americans, for instance; and no matter how good or bad we feel about that now, it happened and we cannot change it. There's a certain beauty to the notion of impermanent existence — that no matter what we do in life, we end up part of the same earthly goo from which we came.